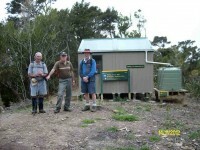 Accessed from Mountain Road from old forest HQ 6 hr ret, Route, DOC and private land. 7. 13/3/2019. Trampers. 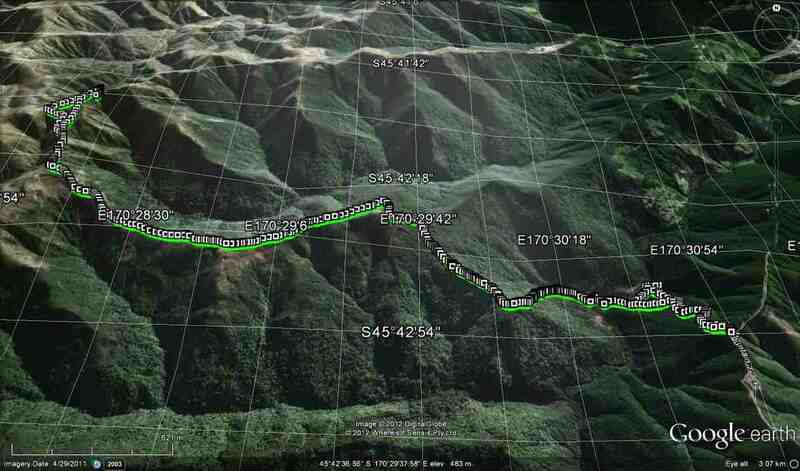 Green track/ River Track. Leader: Neil. till we came to the track, which we did, arriving at 10:25 and so morning tea break was gratefully received by 11 weary trampers. The object of some trampers was to reach the bottom of Rosella Ridge by lunch time. This was achieved by 7 trampers at 12:30 pm. Four had wisely decided to return to the cars earlier, 2 via Eucalypt Ridge, and 2 visited Possum Hut by mistake before returning to the bottom of Miners Direct. 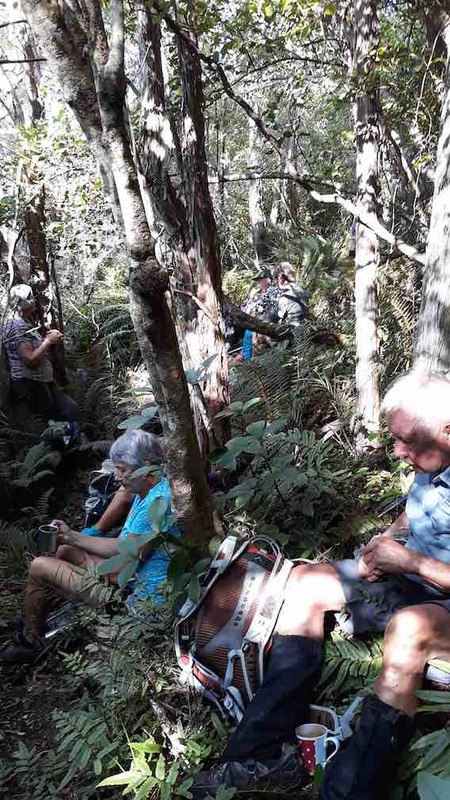 The track from morning tea to lunch was somewhat harder being more overgrown, less defined and not so easy walking, resulting in several members having trouble remaining upright. 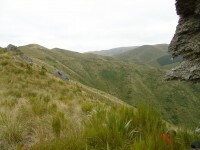 Another aspect of this walk that was commented on was the amount of bird life and bird song that was evident. The return walk took about 2 1/2 hours, arriving at the cars at 3 :30pm. Two took the new track up from the bottom of Miners Direct to the road and commented on the easier gradient all the way. 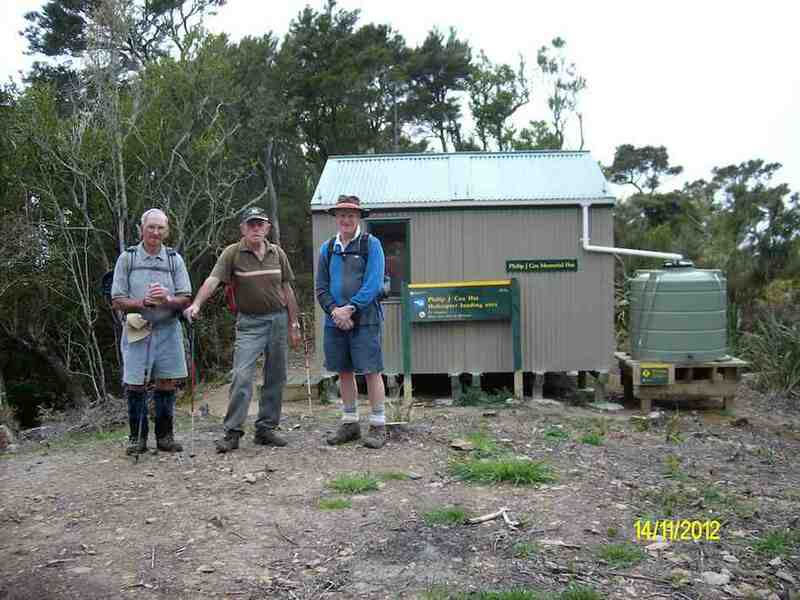 A real credit to the Green Hut Track Group who did the rerouting. 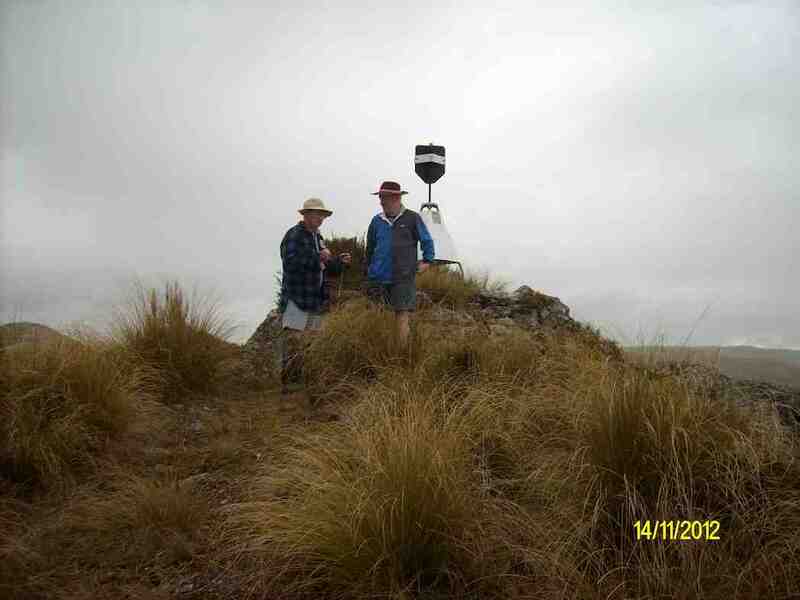 Overall, a day’s tramping enjoyed by all. – Neil. 6. 21/3/2018. Trampers. Tunnels Track. 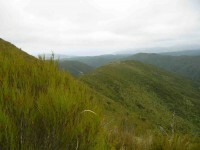 (Yellow Ridge.) Leader: Arthur. 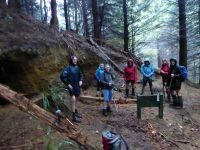 The rain started as we left Mosgiel, but despite this, it wasn’t cold and the eight trampers were VERY DETERMINED to go tramping. 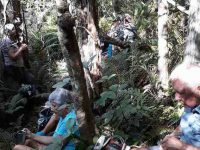 The cars regrouped at Waitati, and ONWARD was the only option – no one wanted to cancel. So it was up Double Hill Road and Semple Road to Mountain Road. A key allowed us through the locked gate and we drove up to, and parked at, the beginning of the Tunnels Track. The rain continued. Our plan was now just to do a short tramp. It was very dark in among the trees as we descended the track, some wag asking for the street lights to be switched on! … where we had a stand-up morning tea. No one was electing to sit on the wet ground. A N.Z. robin kept us friendly company here, which was nice. 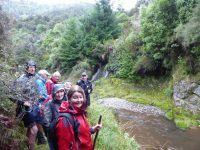 From the Tunnels we followed the old water race to the main track, and then descended to the South Branch of the Waikouaiti River which was up a bit and a little discoloured. No use going further in the rain, so it was uphill back to the cars to finish at 11.15 a.m.
We had travelled slightly less than 4 km, and all had greatly enjoyed our little excursion, which had taken one and a half hours. Surprisingly, the tracks were not slippery, even on the steepest bits. Into the cars and to Blueskin Nurseries for hot drinks, before returning to Mosgiel. 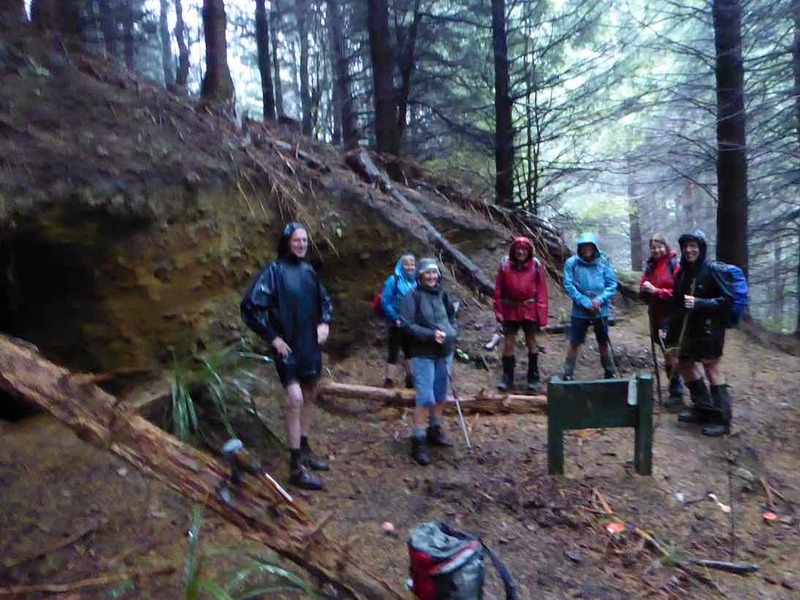 Eight trampers had decided that a little but of rain was not going to spoil their day, even if it was a shortened tramp. Thanks to all participants. – Art. 5. 11/2/2015. Trampers. The Gap, via Yellow Ridge. GPS Yellow Ridge to The Gap, courtesy Ken. 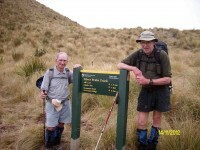 We walked just on 12km We climbed 1000mtrs. ave speed 3km/hr moving time just over 4hrs. Stopped time 3hrs max elevation 700mtrs. 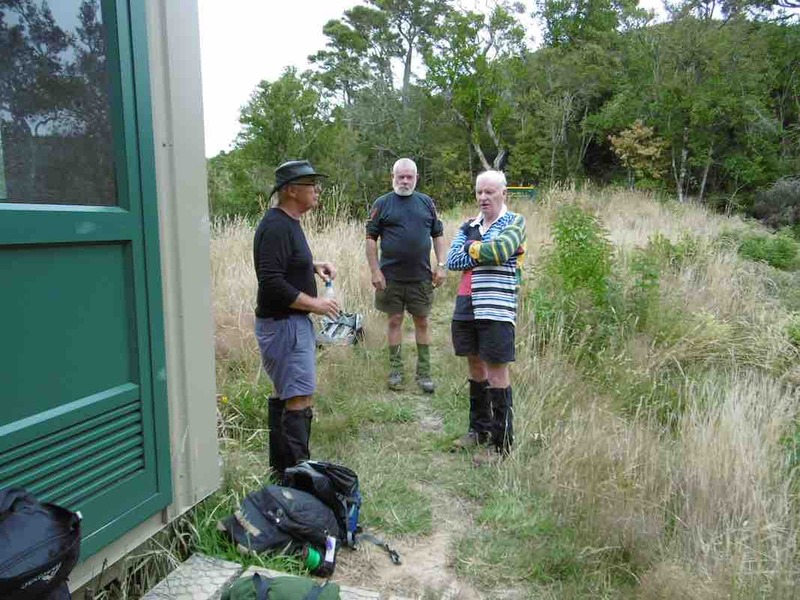 …at the grassed area before crossing the Waikouaiti River, & then climbing the steep track up to the new Philip J Cox hut for a breather. 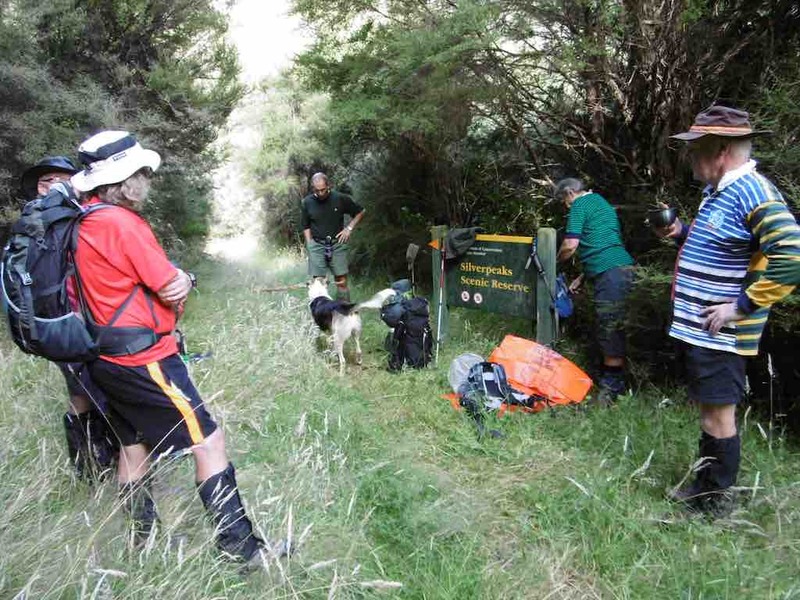 …& another breather before the steep decent into the Waikouaiti River again. At this time, one of the group decided that he would start off down the track, thinking that he had told somebody that he was leaving, & it was not until we all got about 15mins down the track that I noticed he was not in our group, & asked where he was. We stood around waiting, thinking that he was still behind us, but in the end I asked our fittest member if he would go back & check. While he was doing this, we decided that the others would go down to the bottom, & see if he was down there, while I stayed to wait on the member we had sent back up the track. All this took approx 1/2 hr to accomplish, so we knew we would be a bit late getting back to the cars. As it turned out, the missing member was at the bottom waiting for the rest of us to arrive, & was very apologetic for his mistake. 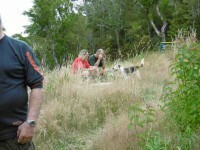 …before we tackled the last climb up the steep track back to the cars. We had decided beforehand to go out the north end of Mountain Rd. as the road is in much better condition at that end. 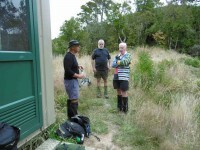 However, when we got to the last locked gate, we couldn’t unlock the padlock with the key that was given to us by City Forests, so it was about turn & drive all the way back to the south end & down to Waitati. The weather was good, with no wind, & not too hot, & the low cloud that we observed when driving in was non existent when we got to the Gap. This is probably one of the harder tramps that we do, & is one that I might forgo in the future, although I managed it quite well, a result I put down to drinking Gatorade, & more fluids than I normally do on a tramp. – Ken. GPS Yellow Ridge to The Gap, courtesy Ken. We climbed just over 1000mtrs. moving time just over 4hrs. The next task was to get to the Gap for lunch, however remote this possibility seemed as, the track actually goes past it, instead of towards it for a while, & you start to wonder when you will be getting closer. where the views are magnificent, despite the lowering cloud/fog that had been hanging around all day. 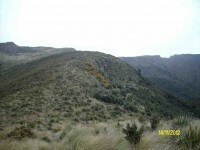 We then retraced our steps, carefully, due to the slippery nature of parts of the track that were very steep. Someone commented ” why didn’t they just provide a ladder” !! 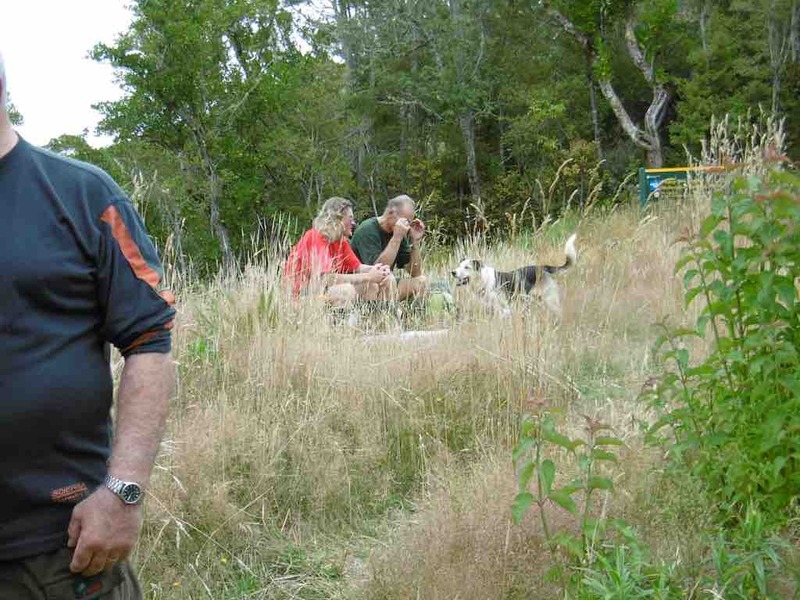 We stopped again at the Phipip J. Cox hut to have another drink, & to pick up our other group member, who we discovered had left a note for us, saying that he had left the hut 1/2 hr ago, & was making his way slowly back to the car. As we travelled back to the river, & up the Tunnels track, he had left numerous arrow signs, & the time that he had drawn them in the soft ground. So we knew how far in front of us he was, & when I arrived at the car, he had only been there about 3 minutes or so. Everybody agreed that it was a worthwhile trip, & even although it’s a bit of a ‘gut buster’ it’s worth doing, but the early start, & the gate key is a must if you want to get home at a reasonable time. We made it back to the Bush Rd. car park just after 5pm, & I was home by 5:30pm. – Ken. 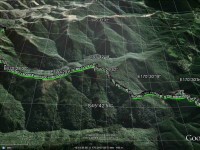 Mountain Road, Tunnels track, Yellow Ridge, the Gap. On Monday 4 Feb 2002, George Haggie, Hazel Leslie and Ian Fleming receed the route for the Taieri Recreational Tramping Club. We left Green Island meeting point at 8.30. On George’s prompting we drove further north and entered Mountain Road at Merton and drove 17 kms back to the Tunnels Track DoC sign on a good well metalled road arriving there a 9.30. 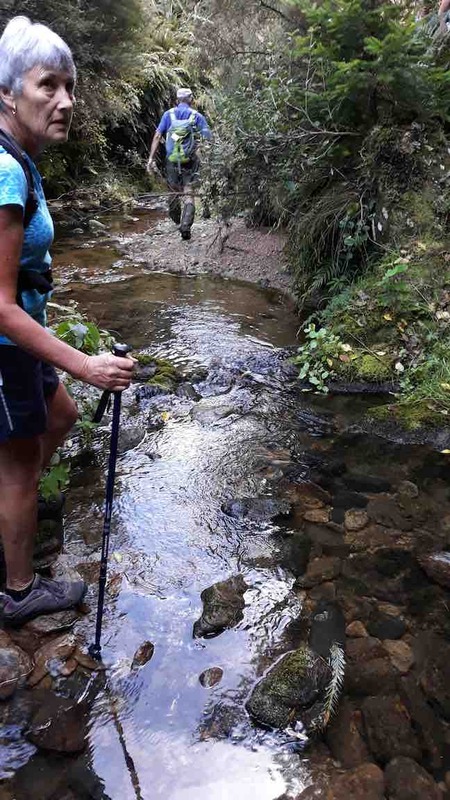 The south branch of the Waikouaiti River was shallow enough but the track up to the manuka scrub was in poor condition with a large slip crossing it. 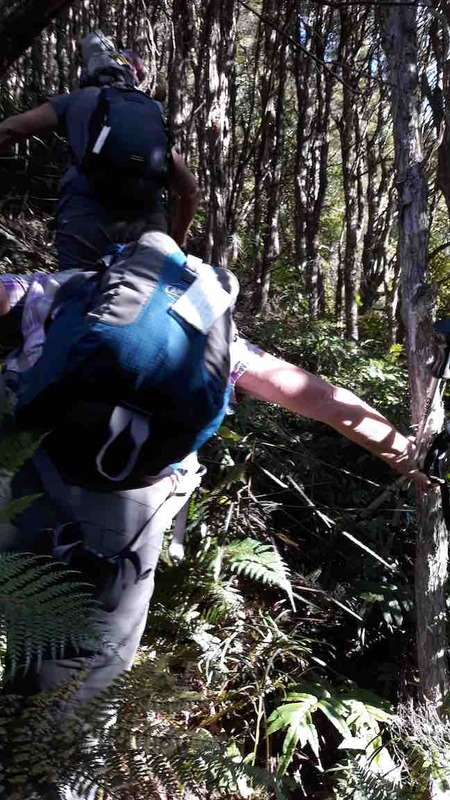 Once in the trees conditions improved greatly and it was most pleasant all the way to Yellow Hut which we found to be in poor condition inside. 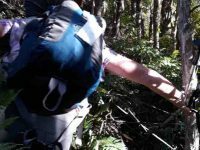 A DoC sign recommended going any further for experienced trampers only due to Silver Peaks notoriously changing weather conditions. Beyond the hut we were into large tussock which being largely dry was not too much trouble to wade through although we walked more by faith than sight through the sea of tops, confirming we were still on the track with our feet. in many cases. 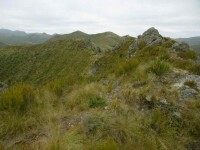 The route does a left-hand semicircle on a broad ridge. 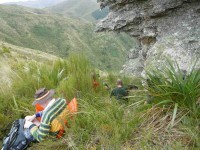 We lunched at the Gap at 12.15 in a very slight smirry rain but under dry rock overhang. 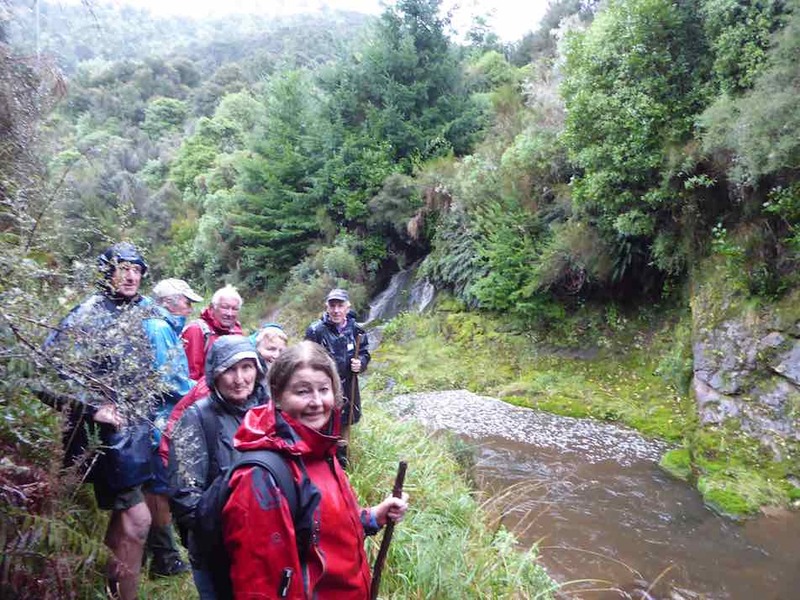 Returning, the tussock, now wet was much more difficult to push through, with the wet leaves lying lower onto the track, tangling our feet and tripping us up. The notorious steep never-ending climb back up from the Waikouaiti to Mountain Road keeps getting longer with more rest stops as one ages. We got back to the car at 3 pm and continued round Mountain Road, now striking many potholes with several spots so severe as to be almost impassable. 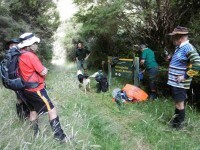 This part was 13 km from Tunnels Track to Waitati. The sandy road metal contrasts with the rock metal on the northern part and although a few kms shorter and with many main highway kms eliminated is not to be recommended at the moment. Returned home just on 5 pm, having driven 103 kms. 2. 23/2/2000. The Gap via Yellow Hut. Leaders: Margaret and Les, Ian. 1. 12/11/1997. Tunnels Track to Yellow Hut and Gap. Leaders: Les and Margaret, Claude.